I think China is in a transition, to slow for some . But I think it makes progress compare to 50 years ago . Anytime you rely on 40% of your production to be bought by one country you can get played. Politically Canada is a joke to the rest of the world right now. The US thinks we are complete morons letting ISIS back in, opening our borders, taxing our own oil industry to extinction while purchasing Saudi oil. Our country reeks of stupidity. Hard to be taken serious at any level. 440duster, crw, jvw and 11 others like this. I think that issues like this point out a fundamental problem in our country. Within our vast country we have the such a vast array of resources that we have the ability to be almost completely independent without major imports. But we have been led to believe that the way to prosperity is to export the raw products, let others process it, and then import the final products back. We are told labor costs are the main reason. I can believe it is the best for companies. I don't believe it is best for our country and society though. Processing and producing higher value products from raw commodities within Canada would, at least at first glance, lead to higher prices for consumer products. It would, however, create many new jobs and with proper incentives it could translate into reduced dependency on unemployment insurance, welfare and other social assistance programs. That should mean that the working public's burden of paying for these programs should be reduced which could, in turn, translate into lower taxes. Having more people earning a wage would also create a larger income tax base to tax and that can allow for lowering tax rates, which translates into more people having a paycheck as well as keeping more of it in their pocket to spend. If a person looks deep enough all of these little added benefits could very likely, on a whole, cancel out the effects of higher consumer prices. Even from a national security perspective it has massive benefits. I don't think we realize how disruptive a major world war would be to our society. If a country like China was on the opposing side the regular shipments every household depends on wouldn't be arriving. A lot of shelves would be bare. It would be devastating to how our society functions at a time when we are at war. I personally believe that companies are at the helm of our great country, not politicians. Certainly not politicians that are working in the best interests of the country. What we see are pawns at best. There are many more benefits but we are told that the only way is to pay others to work cheaply on our behalf and reap the benefits. It will work for a while but I think we will be caught asleep at the wheel. All very true, and good ideas. But getting off this vicious circle and into that direction is nearly impossible. With the exhorbitant costs of our welfare state and bureaucracy, it is nearly impossible to bring manufacturing or value added industries back. But we can't (peacefully) wean ourselves from the same vices until we have industries in place to replace the welfare state and bloated government employment, and all of the associated red tape that goes with it. A consumer without a decent paying job can't afford to pay the additional cost of goods not made in China, so the first manufacturers won't have a willing market to supply. But on the other hand, automation, 3D printing, etc. are quickly making the actual on the floor labour costs almost irrelevant. But for that, we need to quit educating people to be art history majors, and get them into engineering and programming programs. It said on the news today that China is bigger than the next 3 canola markets combined. We were silly to even think this could go on forever. Best its exposed now so we can build up some other markets a bit. But production patterns will have to change. Either less of it, or grown at a few bucks a bushel less than it is now. Yup. The proposed temporary solution is interest free loans. This is of course based on the price and demand recovering in the future because it just has too. No explanation. No actual firm statements to even say why the shipments are blocked. If you have faith in all things government then you know exactly what to do. As for those wondering how you keep asset prices inflated, cheap debt takes #1 position in any list. How debt solves for a commodity not in demand is somewhere further down any list. Solutions involving a high degree of hope and prayer may be worth second thought. Not sure if everyone is talking about same crop , my problem is wheat barley and oats . The world may be comfortable with veg oil stocks, but price doesn't indicate any over abundance, still well off the lows of the last 5 years, and above even where it was in Dec/Jan. 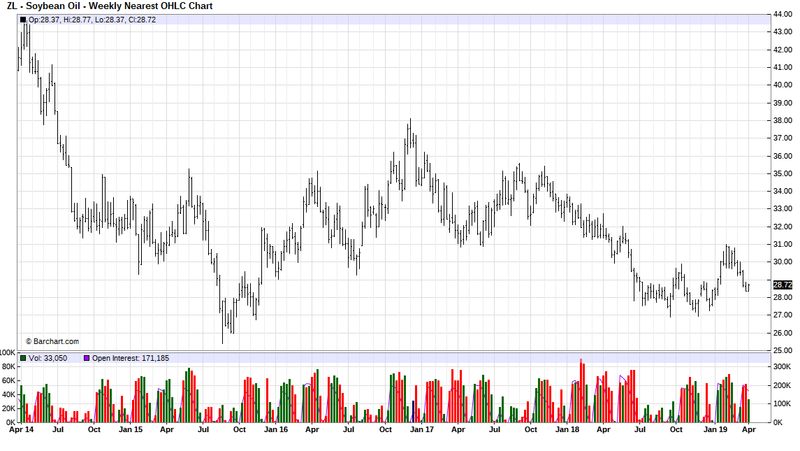 Canola prices have certainly been better with soy or palm oil prices at this level in the past. Perhaps at best, one could say oil prices aren't helping to drag canola higher, but I don't think one can say they are responsible for dragging it lower either. When do you think the price of canola will actually be affected? In the peace almost all our canola goes to Vancouver. We’re not much further than Calgary is. But a long way from the USA. When I ask when I can deliver canola the answer is we don’t know when we can take it in the future. So the price is one thing. Location will become more of a sales/movement issue for us. Price is being propped up to encourage seeding after may I’m expecting prices to drop off unless there is a political change of heart in China. Last edited by Highmarker; 04-02-2019 at 10:31 AM. Fair point, perhaps I am putting too much stock in oil supplies but from your chart, in the last 60 months we’ve only traded lower than today for 8 months or 13% of the time and those lows were made in the summer months. There’s a strong pattern of dropping prices through summer on that chart, there are still 4 more months down of seasonality related pressure from what I would expect. To make a bad situation worse ASF will hurt the value of can/soy meal the longer it carries on.